Ah, yes. There's no way to beat the winter blues quite like a big bowl of steaming soup, am I right? But with cold weather on its way out the door sooner rather than later (see ya NEVER), I had to try to get one more broth-based recipe under my belt. You know, in preparation for next winter. That is, if I haven't fled to the equator by then. Of course. This recipe was inspired by, though not 100% adhered to as-per-usual, my 2012-13 winter-food blog of choice, Smitten Kitchen. Though Deb's concoction was both cardamon and ginger-free, mine had to do without the tahini dollop, due to circumstances quite out of my hands: the tahini had a strange off-smell, which was promptly ignored and then discarded. Moving on. Start by heating your olive oil in a large stockpot over medium heat. 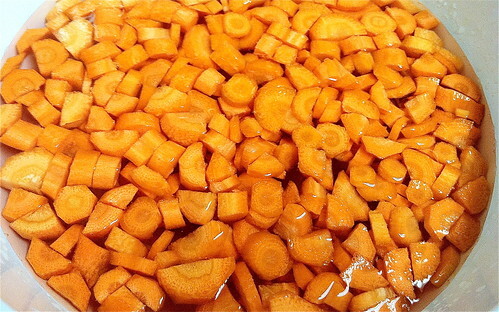 Add your carrots, onion, garlic, ginger and spices and stir until slightly browed and super fragrant, about 15 minutes. In the meantime, preheat your oven to 425 degrees. 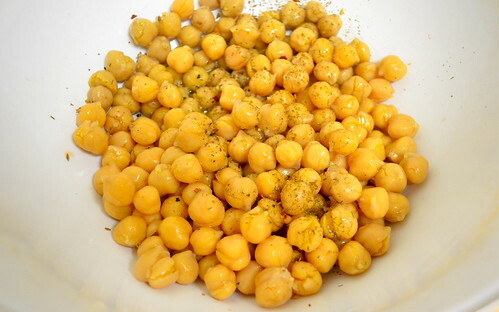 Toss 1 can of chickpeas on a large baking sheet with a generous coating of olive oil and a sprinkle of salt. I also added: oregano and the juice of 1/4 a lemon. (YUM.) 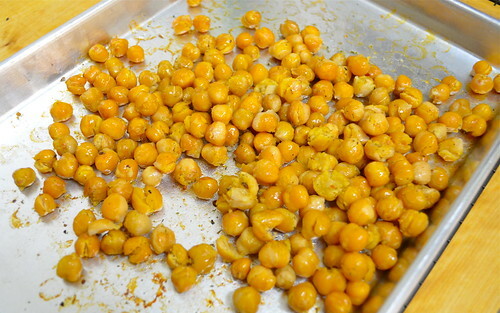 Spread evenly over the baking sheet and roast until they're crispy and only slightly darker. Okay, back to the soup. It's time to add your broth; use the liquid to scrape up any brown bits from the bottom of the pot. This is the good stuff: THE FLAVOR IS HERE. Cover with a tight-fitting lid and simmer for about 30-40 minutes. While your soup simmers away, take out a second baking sheet for your pitas (or pre-wedged pitas, as Deb rightfully suggests: wedging after may leave you with more pita crumbles than crisps). Brush lightly with some olive oil and add a generous sprinkling of za'atar. I also added a little extra sea salt as well as some black sesame seeds. 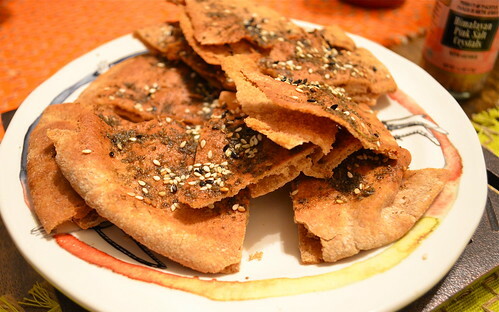 Za'atar is a Middle Eastern spice mixture that usually includes dried sumac, salt and sesame seeds, though several varieties exist. Not super easy to come by in most mega-markets, but can be found in either specialty stores or local Middle Eastern markets. Or you could always make your own. 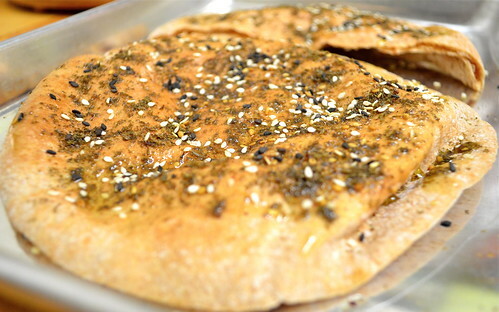 Tuck your pitas into the oven (next to or under your chickpeas) and toast for about 5 minutes, or until crisp. Man, what a recipe for multi-tasking, right? Good thing I skipped the tahini. 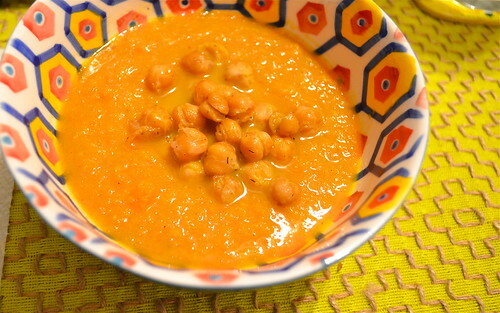 While your chickpeas round to the finish line and your pitas start to toast, peek into your soup pot. Chances are the smell is going to kill you with goodness, but if you manage to make it, test a carrot with a fork. It should definitely be soft enough by now for the really fun part: using your new immersion blender! Or at least, using my new immersion blender. (It's yellow!) 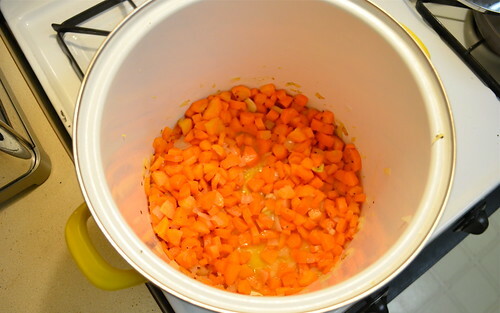 Get to work and puree your soup until mostly smooth--a few chunks of your smashed garlic is nice, as well as leaving a slight texture from those beautiful carrots. Serve with a sprinkle of your crispy chickpeas and a side of za'atar pita. 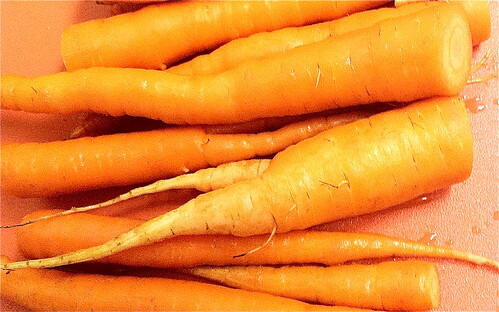 Too pretty in all its orangey, beta-carotene glory. 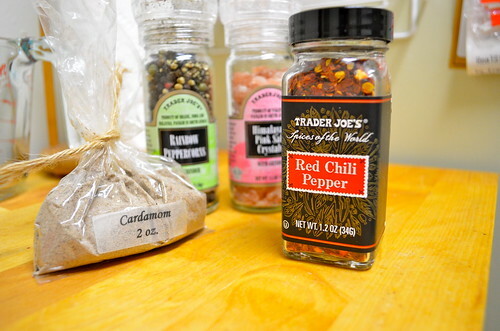 And too good: full of flavor, slightly sweet and a touch of heat. I'll be saving this one to repeat next year.